This BEAUTIFUL HOME IS BACK TO ACTIVE due to Buyer Default!!! VILLAGE OF HACIENDA WEST- IN THE HEART OF SPANISH SPRINGS AND LAKE SUMTER SQUARES--JUST SHORT MINUTES AWAY FROM RESTAURANTS, SHOPPING, GROCERY STORES, MEDICAL- NIGHTLY ENTERTAINMENT!!! Youll find this exceptional ONE OWNER Designer VERA CRUZ. 2,313 SF under heat and air, you will have all they room youll need. Split Bedroom with Master Suite and all bedrooms have closets. BEAUTIFUL UPGRADES: KNOCKDOWN TEXTURED CEILINGS, CROWN MOLDING, PLANTATION SHUTTERS, GRANITE Countertops in Kitchen, Solid Wood cabinets, 6-Panel Doors, High Boy Toilets, EXTENDED INTERIOR LAUNDRY with lots of extra storage and even a small Deep Freezer, lovely LAMINATE flooring mostly throughoutWet areas have Ceramic Tile. 3rd Bedroom has carpet; Expansive Florida Room adds approx. 187 SF to rear of home with lots of privacy (Upgraded LOW SOUND windows on rear)! You have TWO SCREENED IN BIRDCAGES- One has a Coleman Spa Hot Tub (approximate 2013)- Also, there is a BRAND NEW GOLF CART PATH--Zippity Doo-Dah all over everywhere!! All Room Sizes are to be verified by Buyer. Furnishings do not convey. Lawn Tractor does convey. 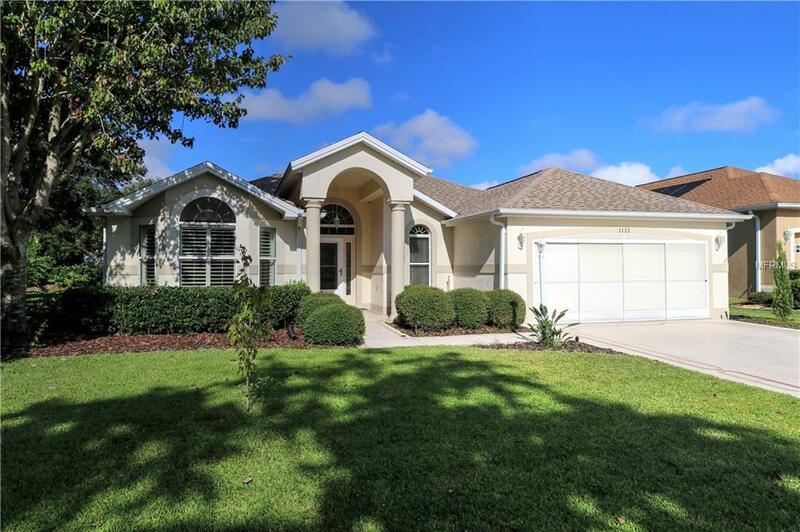 TRULY BEAUTIFUL HOME; MOVE-IN READY. AND BOND PAID!!! All Room Sizes-approx and should be verified by Buyer.